This week’s French Fridays with Dorie recipe is called M. Jacques’ Armagnac Chicken. This recipe is a simple down-home recipe perfect for a lazy Sunday dinner. 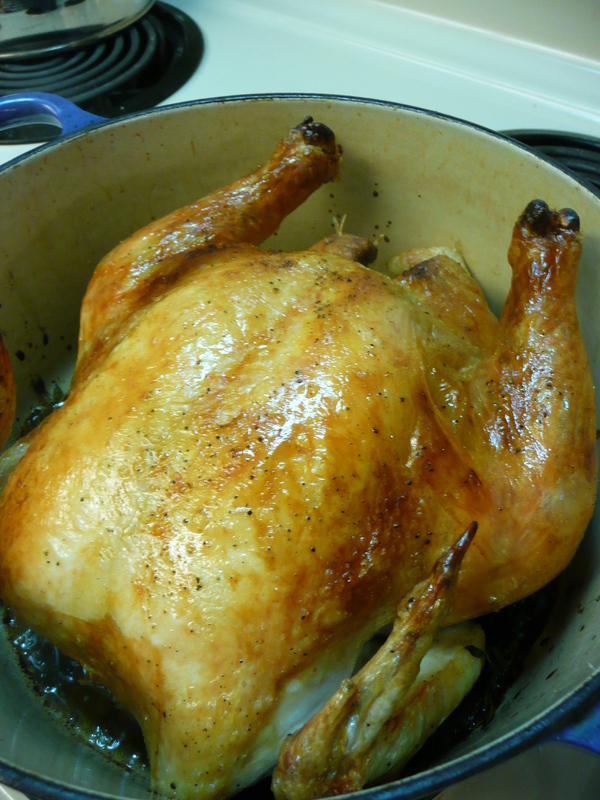 A whole chicken and vegetables (potatoes, onion, and carrots) are placed in a large covered pot. Pour some Armagnac around the chicken and roast in the oven for an hour or so. The chicken creates a tasty sauce while it cooks. The end result is a simple, but delicious, one-pot meal. Armagnac is a distilled spirit made in the Southwest region of France. Dorie suggests Cognac or other brandy as a substitute. I used a brandy I already had on hand rather than try to find the Armagnac. The only issue I had with this recipe is that my chicken did not come out “beautifully browned” as Dorie said it would. Perhaps it was because I did not use a cast iron dutch oven? Even though it wasn’t browned, it was still juicy and delicious. Not browned, but still yummy. We loved this dinner! This is my husband’s favorite type of meal as he particularly loves chicken. I can see making this often in the cooler months. Broccoli is a family favorite vegetable in my household, so this week’s French Fridays with Dorie recipe was definitely not “experimental“. It’s called “Garlicky Crumb-Coated Broccoli” and it was fabulous! Dried bread crumbs are toasted in melted butter sauteed with garlic, then tossed with lemon zest and fresh mint or parsley (I used parsley). Just tender steamed broccoli spears are rolled in the crumbs, making the broccoli dressed-up and ready for company. The garlicky bread crumbs are to-die-for delicious. I caught myself eating little spoonfuls of just the bread crumbs on several occasions. The flavor of the lemon zest adds a bit of spark, and of course you can’t go wrong with bread crumbs sauteed in butter. You could use the bread crumbs in other recipes too; I think they would be wonderful on baked fish. Maybe even tossed with pasta! I served the broccoli with Chicken Piccata, one of my favorite quick-and-easy chicken recipes. It was perfect with the broccoli: not only did the flavors go well together, but the chicken used the juice from the lemon that I zested for the broccoli. The recipe for “Garlicky Crumb-Coated Broccoli” can be found in Dorie Greenspan’s cookbook Around My French Table. The Chicken Piccata is from San Juan Classics Cookbook (one of my all-time favorite cookbooks) and is a bonus recipe this week. For some reason my chicken doesn’t look as attractive as usual, but trust me – it tastes good! Place chicken breasts between two pieces of plastic wrap and pound with a mallet to a thickness of ¼ inch. On a plate or shallow dish, mix flour and salt. Coat the chicken in the flour mixture, shaking off excess. In a large skillet, melt butter over medium-high heat. Add garlic and cook until brown. The garlic can be discarded, but I like to leave it in. Add the chicken breasts to the pan and quickly saute until browned on both sides and cooked through. Remove to a platter and cover to keep warm. Deglaze the pan with the white wine and lemon juice. Return the chicken to the pan and heat through. Top with the lemon slices. Transfer the chicken to serving plates and top with the sauce. Garnish with the capers and parsley. Serve immediately. This one is for my good friend J. She and I were roommates for quite a few years in our twenties, and we both enjoyed the Enchiladas con Mole from La Cocina & Cantina restaurant in Seattle’s Capitol Hill neighborhood. This recipe comes from Better Homes and Gardens Biggest Book of Slow Cooker Recipes. The recipe as it is written calls for serving the chicken in whole pieces over rice. The first time I made this I kept thinking how good it would be made into enchiladas. I decided it was time! To start, I cooked the chicken according to the recipe. After the chicken was cooked, I removed it from the sauce and shredded it. I then used the shredded chicken to fill corn tortillas. The cooking sauce became the enchilada sauce, and it was all topped with Jack cheese. Yum! The leftovers reheated pretty well. They weren’t quite as good as the first night, but still good. And you can’t beat having a dinner you can just pop in the oven! I had two extra enchiladas that I froze before cooking. When I take them out to eat I will report back to let you know how well these freeze! If you prefer a less-spicy sauce, cut the jalapeno peppers in half and remove the ribs and seeds. If you like your sauce a little spicy, leave the peppers whole. To make the mole sauce, place the tomatoes (including their juices), onions, almonds, garlic, jalapeno peppers, cocoa powder, raisins, sesame seeds, sugar, salt, and spices in a blender or food processor. Process until the mixture is a coarse puree. Remove the chicken from the cooker and place it on a plate. Stir the sauce; keep it in the slow cooker on the “warm” stetting (if your slow cooker has one) to keep the sauce warm. When the chicken is cool enough to handle, shred the chicken, discarding the bones. You should have around 4 cups of shredded chicken. If the chicken seems dry, add a little mole sauce to moisten it. Preheat oven to 350°F. Put about ¼ inch of the vegetable oil in a small skillet, and place over medium-high heat. When the oil is hot, cook the tortillas one at a time until they are softened, about 10 seconds each. You may need to add more oil to the pan partway through cooking. Drain the tortillas on paper towels. Coat the bottom of a large baking dish with a little of the mole sauce. Place about ¼ cup of shredded chicken down the center of each tortilla and roll it up. Place the tortillas seam-side down in the prepared baking dish. After all the tortillas are filled, pour the mole sauce over the enchiladas. Sprinkle the Jack cheese on top. Bake uncovered for 30 minutes, or until the cheese and sauce are bubbly. Garnish with cilantro and sour cream, if desired, and serve. There used to be a Moroccan restaurant in Seattle called Mamounia, located on Capitol Hill. My high school friends and I went there once or twice. It was so long ago, I can’t remember if we went when were actually in high school or as young adults. Going to Mamounia felt very exotic! There were belly dancers, and we sat on cushions on the floor and ate with our fingers. As I recall, we weren’t very adventurous with our menu selections…three out of four of us picked the “safest” item: chicken. Eating at Mamounia was a multi-course affair. The thing I remember most about eating there was something called Bastilla. 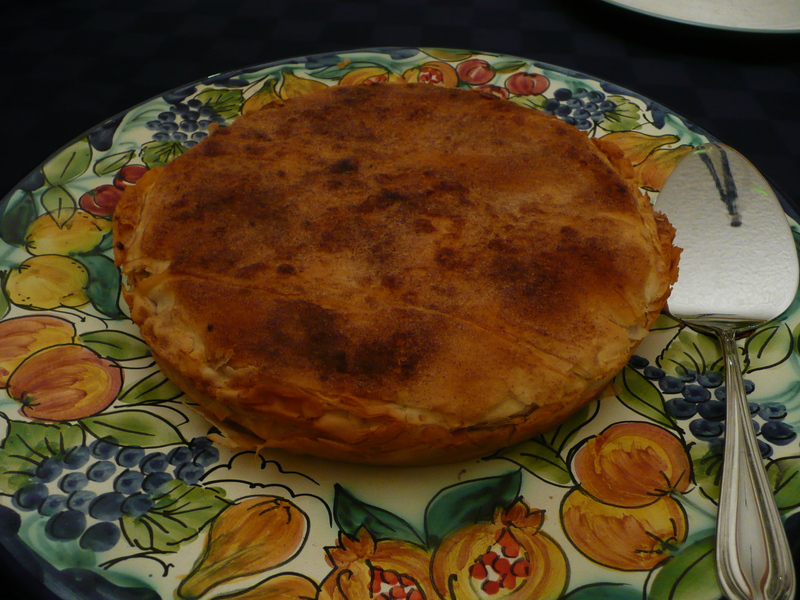 It was a savory chicken pie wrapped in phyllo, and the top was sprinkled with cinnamon and powdered sugar. The whole pie was set in the middle of the table and we dug into it with our hands. 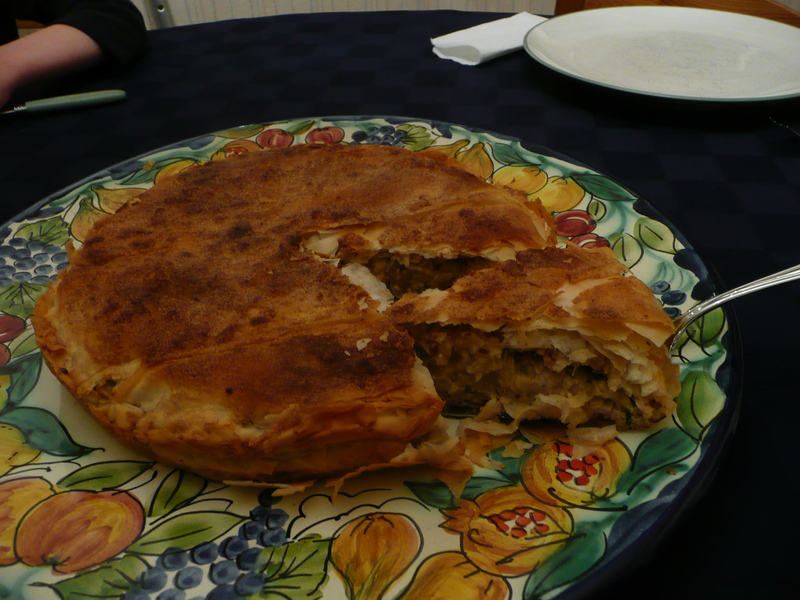 I loved the flaky phyllo crust and the contrast between the sweet cinnamon-sugar topping and the savory filling. Off and on over the years I have thought about this Bastilla and wanted to go back to Mamounia just for that. Imagine my delight when I found a recipe called Chicken B’Stilla in Around My French Table! I was even more excited when it was picked as a selection for French Fridays with Dorie. Wait! A Moroccan recipe in a French cookbook? Just like in the United States, French home cooks are inspired by flavors from around the world, with Moroccan flavors being fairly common. Making Chicken B’Stilla is pretty involved process with a lot of steps. The smells of the spices (saffron, cinnamon, ground coriander) while cooking were heavenly! I have never enjoyed working with phyllo, and making this did nothing to endear me to it. Let’s just say it’s a good thing there was a round piece of phyllo placed on top, otherwise my pie would have not been pretty! It’s been so long since I ate Bistilla at Mamounia that I can’t remember the flavors well enough to compare to the B’Stilla I made. I do recall a stronger cinnamon-sugar flavor. If I make this again, I may sprinkle cinnamon and powdered sugar on the pie after baking rather than before. I really liked the flavors of my pie and the crispy, flaky phyllo crust. Dorie mentions in the book that this dish is best served the day it is made. While I agree that the crust was a little better the first night (though I found it crisped up pretty nicely while reheating), I actually enjoyed it even more the second night. Perhaps the flavors had a chance to blend a bit. Overall, a fun trip down memory lane! My mother-in-law was out of town for Christmas and well into the new year, so we did not get a chance to celebrate Christmas with her. This past weekend we had her over for dinner for a mini post-Christmas celebration. I decided to make the entire meal from Around My French Table. My mother-in-law spent a good couple of hours pouring through it last week, so I knew she would be up for a French feast. Also, I am still excited about my new cookbook and there are so many recipes I want to try. We started off with Tapenade Bâtons, a variation of Mustard Bâtons. Delicious and so easy to make! 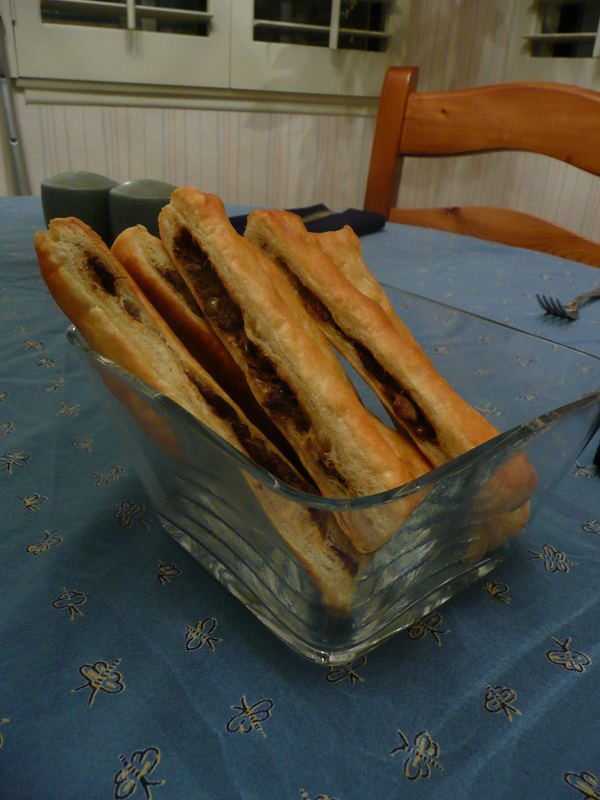 I had leftover puff pastry in the freezer and tapenade in the fridge, so this one was a no-brainer. For the main course, I made Roast Chicken for les Paresseux (Roast Chicken for Lazy People) and Brown-Sugar Squash and Brussels Sprouts en Papillote. The chicken was fabulous with crispy brown skin and tender meat. My husband especially loved the garlic that roasted along with the chicken. My mother-in-law and I both enjoyed “the bread trick” (the chicken is roasted on top of a piece of bread which soaks up the cooking juices and gets wonderfully carmelized). The squash and Brussels spr0uts were also a big hit – even my seven year old daughter ate her share. 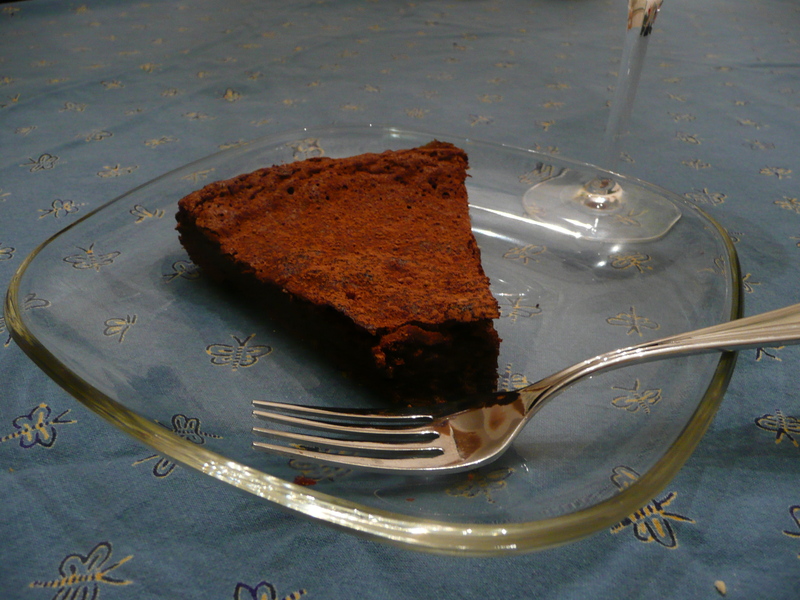 The grand finale was also this week’s French Fridays with Dorie recipe: Michael Rostang’s Double Chocolate Mousse Cake. I had a few issues making this cake. The biggest issue was that I did not have the right size pan. The recipe calls for an 8-inch springform pan. The pan I used measured 9½ inches. I also have a 6-inch springform pan. In retrospect I wish I had used the smaller pan and put the extra batter in a ramekin or two. There was also a problem with the egg whites that are folded into the mousse. I’m not sure if I over-whipped them or if I folded them in too vigorously, but the resulting batter did not seem “light” enough and kind-of seemed to “liquidy”. When baked, the cake did not rise as much as the recipe described. Finally, the recipe has you place the pan without its bottom on a baking mat or parchment paper. I noticed some pretty big gaps under my pan, and my batter was fairly thin, so I decided to use the pan bottom to prevent seeping. The cake would have been difficult to move to a serving platter, but luckily I did not care about that. Despite the few issues, the cake was delicious! It was met with rave reviews. The recipe provides three ways to serve this dish. The first night we went with the warm option: part of the batter is baked and then cooled, then the rest of the batter is poured onto the chilled base and baked again, then served warm. The next night we had the baked and chilled option. While I enjoyed both versions, I preferred the texture of the chilled one. I will certainly be making this one again. I’d love to resolve my egg white issues and I like to track down an 8-inch springform pan or try it with my smaller pan. This cake is definitely worth perfecting! 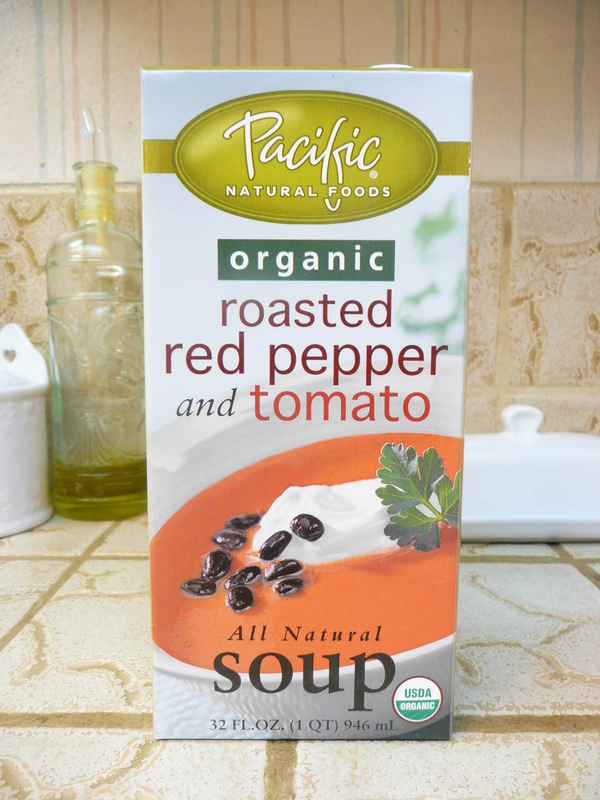 One of our favorite quick, “I don’t feel like cooking” meals is Roasted Red Pepper and Tomato soup. We like both the Pacific brand and the Trader Joe’s brand. I hadn’t ever thought to “enhance” the soup until the other day when I was shopping at Trader Joe’s. The sample of the day was the Roasted Red Pepper and Tomato soup with some corn and brown rice in it. The woman handing out the samples was talking about all the ways she adds to the soup, and she told me about her “Mexican-inspired” version with corn, green chiles and chicken. That sounded really good to me! Saturday nights are often one of those nights where I’d like something quick to prepare for dinner. 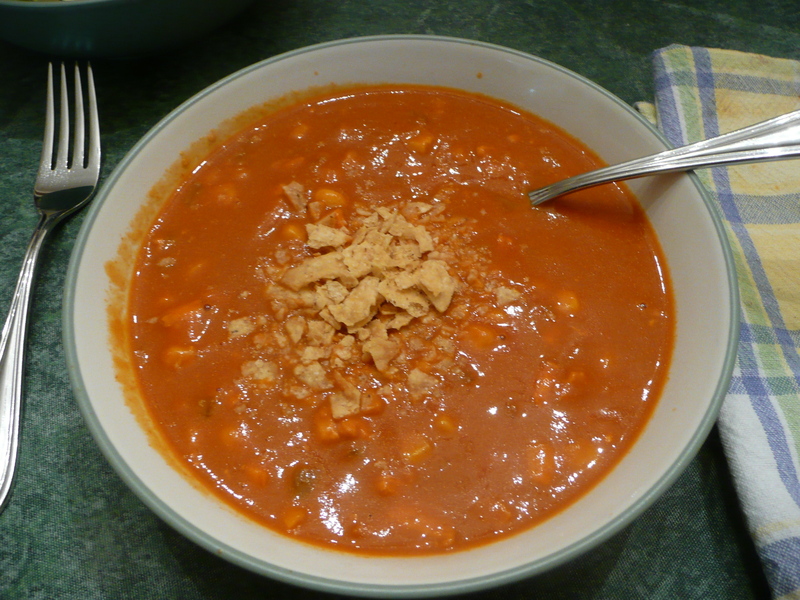 I decided to create this “Mexican-inspired” soup while it was still fresh in my mind. I definitely can’t take credit for the idea, but the proportions are all mine. This is one of those dishes where you can keep all the ingredients on hand, so you can make the soup whenever you need something quick and easy to put on the table. I poached a chicken breast, but this would be a great way to use up leftover chicken. Combine soup, corn and diced green chiles in a 3 quart saucepan. Heat the soup on medium and bring to a simmer. Add the chicken. Reduce heat to low, and slowly stir in the shredded cheese to melt. Serve with a sprinkling of crushed tortilla chips on top, if desired.